Friendly Fleur is a playful little pup, at only 10 weeks old she loves her toys and is great with other dogs, cats, and people of all ages. Fleur has been in our care since being abandoned at only a few weeks old by her breeder, suffering from a severe groin hernia which has now been successfully operated on and will cause her no problems in the future. She has had her all clear from the vet, so we are now ready to help her find her forever family. She is currently undergoing her primary vaccination course, and has previously been on strict crate rest, so she hasn’t been walked yet, but she is an intelligent pup and is already responding to basic commands. In her new home we recommend she has formal puppy training to keep her well socialised, teach her commands, and keep her intelligent little brain busy. Fleur is ideally looking for an active family home where there is at least one other resident dog, and she will be fine with school age children. As Fleur is still a young puppy she will be adopted on the understanding that she returns to our vet practice to be neutered once she is old enough. 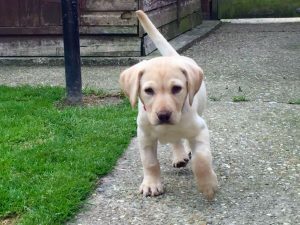 She will be vaccinated, microchipped, flea and worm treated, and she is currently being fostered in Deal, Kent.